Teal Green Velvet Wrap Dress - New Look - size 12 - Excellent Condition. Condition is New with tags. Dispatched with Royal Mail 2nd Class. ELASTIC WAIST SKIRT, FULL LENGTH = 90 CM (35.3" ),FULLY NYLON LINING. Authentique Moroccan luxury kaftan butterfly (abaya, caftan, takchita) black. Authentic Moroccan kaftan butterfly, black. Made of two garnements, first layer made of satin and second of muslin. Really nice work and beads with sfifa all over. 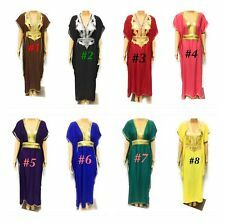 Size of inner kaftan 26 inch bust. Outer kaftan is a free size. drop: 55 inch hem to hem. Other colours and sizes available all listed, check my other listings please. I have included the pics of the cream version - but this item is the mint green one. Double layered with cami dress underneath. Really flattering empire cut. Peaked beaded detail with drop waistline. Fully lined attached in black silk lining. Pretty purple PURE SILK midi knee long batwing short sleeve dress by WAREHOUSE. Has av neckline, with short elbow length batwing style sleeves. Approx just above the knee length, depending on your height. KAREN MILLEN Gatsby Flapper 20's Silk Beaded Evening Cocktail Dress 10 UK. Peaked beaded detail with drop waistline. Fully lined attached in black silk lining. By TFNC LONDON. sheer chiffon Mini flare prom dress. 100% Polyester. Don't miss ! 87.5cm full length. Really pretty and feminine, layered frilled selves. I have in black as well. Lovely sleeveless next dress with detachable corsage detail. Perfect for a Christmas night out or special occasion. Shoulder to Shoulder: 47cm. Length: 90cm. United Kingdom. Country of Origin. This is a stylish navy dress that has a subtle floral pattern throughout it. It has batwing sleeves, v neck with a tear drop back and has a collar neck. MARKS & SPENCER LADIES DRESS. Ideal to wear as party/evening/ocassion/wedding wear. Very flattering on. Striking satin/silky band under the bust which ties at the back. FRENCH CONNECTION FCUK CREAM BLACK ARROW PENCIL DRESS. Contrasting colour block cream cape style top and black pencil skirt. We are a pet and smoke free house. V neckline with zip edge detail around collar and functioning centre-front zip. Ladies Dress Fever UK 12 salmon colour & ivory fine cotton, fitted waist 29", wide lined skirt, back zip, 3/4 sleeves slight batwing gathered into elasticated cuff, used but very good condition. • Ladies & Gents clothes & boxed shoes. KAREN MILLEN STUNNING CROCHET AROUND NECK COCKTAIL DRESS. Peaked crochet neckline 3/4 batwing sleeves. Removable stretch jersey lined. The fabric has a slight stretch to ensure a perfect shape and fit. Gorgeous front knot cocktail dress. Bought from Boohoo but never worn. KAREN MILLEN . Very lovely and comfortable dress for formal or casual occasion. V-neck mini dress. Fully lined with concealed zip at the back. grab it before it goes! New listingSIZE 16 JOANNA HOPE WRAP OVER DRESS VGC!!! SIZE 16 JOANNA HOPE WRAP OVER DRESS VGC!!!. Dispatched with Royal Mail 2nd Class. Ladies Feel Free London Blue Satin Look Dress Size 10 Plunge Neck Party Occasion. Condition is Used. Dispatched with Royal Mail 2nd Class. Please ask for any additional photos, information or measurements as I want you to be happy with your purchase. Look carefully at photos as they make up part of the description and items may have slight marks / scuffs consistent with pre-owned goods. Please look at my other items. When possible I will combine postage. If in the unlikely event there is something you are unhappy with please contact me and I will do my best to resolve any issue. Thank you so much for looking at my items. Pretty baby blue butterfly floaty party dress with elasticated waist, unwanted gift. Spotlight by Warehouse silk dark blue dress with gold edging and sequinned pattern with elasticated waist size 6. Worn once for a special occasion. In very good condition. Pit to pit measures 25.5 Buttons at front. Happy to answer any questions. Returns not accepted. Ladies Black Next Dress Size 12. Condition is New with tags. Dispatched with Royal Mail 2nd Class. Lovely coral colour with black and gold stripes. - amazing dress - made in italy! Very unique and will not be seen in many other places!